A personal learning network is little more than a network of people, groups and communities with whom you interact. The purpose of this network is to help you grow and learn. There are many articles on the subject. A Teachers Guide on Creating Personal Learning Networks provides a helpful introduction with links to many excellent articles and videos about PLNs. However, one the best ways to start building your network is to take action. With that in mind, I offer the following 15 challenges, each designed to help you start reaching out and connecting with new and interesting people. If you decide to take up the 15 challenges, consider sharing your experiences on Facebook, Twitter, your blog (if you don’t have one, why not start now) or elsewhere. You might want to use the hashtag #PLNChallenge to share and talk about your challenges on Twitter. To add some interest (and a little incentive for you achievers), I will be offering a special badge of recognition for anyone who completes at least ten of the challenges and provides evidence of their completion. This is no small challenge. It will require time, effort, and stepping outside of your comfort zone, but I guarantee you that it will be rich with learning experiences and meaningful interactions with interesting people. There are not many rules. Do them in any order and complete them as quickly or slowly as you want. However, to earn the badge you will need to give clear evidence that you completed at least ten of them. They can be things that you’ve done in the recent past (within the last year or two) as long as you can give the evidence. Once you complete at lest ten challenges, send me your evidence using the “send a message” link at the top of this blog. The badge will have a 36-month expiration. Why? I want the badge to represent people who have a somewhat current and active commitment to connected learning. Also, if you are planning on attempting the challenge, consider posting a comment to let me and others know about it. If there are enough of you, we can even build a little community of people who are working toward this rare and prized badge. Before you get started, I’ll offer one pre-challenge challenge. Consider sharing the news about this challenge with a few others or on your favorite social media outlet. That might help us build a bit more of a community around this. Of course, if only a few people take and accomplish the challenge, that just makes the badge that much more exclusive. Are you ready? Here is your list of challenges. Making Contact – Read a great blog post, book (or watch a video) and find the contact information for the author. Contact her/him (email or other), thanking them for their work and sharing how it had value for you. Online Communities – Join a Google+ Community, LinkedIn Group or Facebook group that is focused upon a topic of personal interest. You can learn about other independent communities about education here. Take the time to learn about the existing conversation and then make two or more contributions to the group. Join the Blogosphere Conversation – Find two or more educational blogs that interest you. Review some of the existing articles and consider tracking their new posts/articles. If they have a “subscribe option”, try subscribing so that you are notified when there are new posts. Make a substantive comment on at least two articles. As a great way to find blog posts and articles of interest, consider setting up a Google Alert. This will send you an email notification each time there is news or a new blog post on the web about a topic of interest. There are a number of alternatives to Google Alerts that are excellent as well. Learn about seven of them here. Micro-blogging – Find and follow at least ten new people on Twitter who are contributing to a single topic of personal interest in education. Make at least five Tweets to interact with one or more of these people about that topic of interest. Real-time Micro-blogging – Participate in a Twitter Chat. These are scheduled meetings of people on Twitter. They use a common Hash Tag (e.g. #edchat – which is one of the most well-known education Twitter Chats) and gather at a scheduled time to interact around an open or pre-determined topic. There are hundreds of scheduled Twitter chats from which to choose. It can be a bit disorienting at first because a busy Twitter chat moves quickly. You might find it useful to try one of these four tools. As an alternative, you can host a Twitter chat on a topic of interest. The only requirement is that you need to get at least 10 other people to join you for the Twitter Chat. Just make up a hash tag, set a time and topic, and start inviting people. You might also want to read up on how to host a successful Twitter chat. Attend a Free Webinar or Online Conference…and Network – There are thousands of free real-time web-based sessions on any number of valuable education topics. Find one, attend, and interact with the group. It can be a wonderfully engaging learning experience, and you can discover new possibilities who also meeting interesting people with shared interests. Just search around online and you are likely to find many options. You will also find that many professional education associations host them, so check out the web site for any favorite groups. Here are a few of my favorite sources: Connected Learning, Education Week Webinars, The ISTE Webinar Series (not free but good), eSchool News Webinar Series, ASCD Free Webinar Series, Discovery Education Webinars, The Global Education Conference, and Classroom 2.0 Live. I also host webinars from time to time, so look for them on Twitter. I’ll try to post them here as well. Social Bookmarking – Create an account at one of the social bookmarking services. Consider Del.icio.us or Diigo as a starting point. Then invite two or more friends or colleagues (local or people who you meet online) to create a bookmark group where you can all contribute resources and short annotations on a common topic of interest or a project that you are all working on together. How did it work? The Pinterest Experience – Create a Pinterest account and follow at least five people of interest. Note that Pinterest is now about much more than crafts and cooking. You can find all sorts of relevant resources. In addition to following five people, pin at least ten items of interest to your own board. Create a Mashup of Your Favorite Online Articles – Create an account at Scoop.it! and build your first mashup of articles and resources that you find interesting (use ideas that you found through your other challenges, perhaps). Once you created it, share it on Twitter, Facebook or another social network/outlet. The Networking Challenge – Create a list of 5-10 people who you would love to meet to learn from their work in education. Find out how they are active online and start following their work. If they have a Twitter account, follow them. If they have a blog, subscribe to it. You get the idea. Then reach out to at least two of these people with an email, LinkedIn message or some other communication tool. Thank them for what they do, noting specifically how their work benefits your own thinking and work in education. The Interview – Interview someone who is doing great work in an area of interest. It can be an email interview, phone, in person, a live Twitter interview, a Skype session, a Google Hangout or anything else that interests you. If you want, you can even stream it for others to watch (like in Google Hangouts on Air). Join a Distributed Team – Find a group of people online who are building or creating something of interest and volunteer to help out. Make two or more meaningful and substantive contributions to the project. Or, if you prefer, create your own group of people to build or creating something of value in education (a shared curriculum project, etc.). Start by finding something that you already want or need to create and then using your growing PLN to find others who want to work on it as well. I encourage starting small, something that can be completed in a relatively short period of time. You might even start with being a contributor to a popular wiki (even Wikpedia). The Blended PLN Challenge – Attend a workshop, conference or other in-person event and join in the back channel at the event. This is likely on Twitter, but there might be other online outlets as well. Try to identify one or more people with common interests and connect with them (follow them on Twitter, join any communities that emerge from the event, etc.). You might also consider attending a Twitter “meetup” if someone organizes it. This is where people on Twitter get together in person at the conference or event. You will quickly see how a blended PLN allows you to extend and enhance a face-to-face even by connecting with people before and after the event. The Open Course Challenge – Sign up for a free open course on a topic that interests you (Check out Canvas.net, P2PU, Udacity, Udemy, Coursera, and EdX. You can also just do a search for “list of MOOCs.” I suggest looking for ones that are social or use the term “connectivist.” These will have the most peer-to-peer interaction. By the way, I’m running one right now at www.beyondlettergrades.com and I have plans for a couple more in the upcoming 6-9 months. Create a Visual Map of Your PLN – Now that you’ve engaged in many of these activities, build a visual that represents this growing network. Here is an example of one created with the free online tool, MindMeister. However, instead of just listing the technologies/tools for your map, try writing out the names of people, groups and communities. 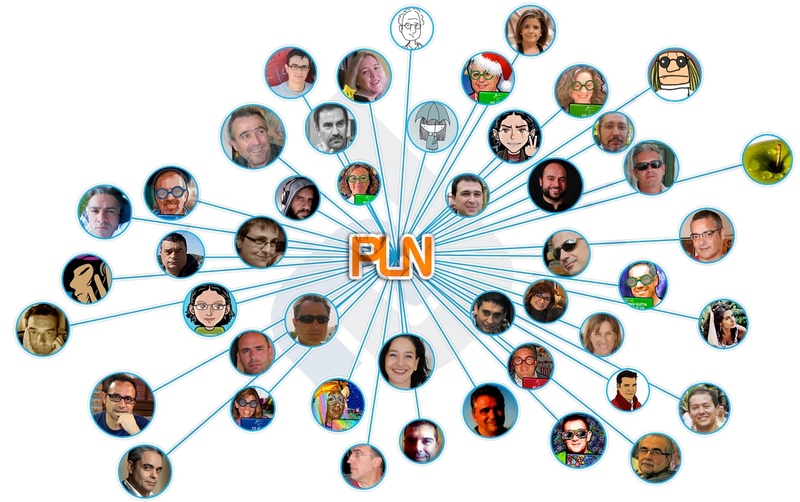 After all, a greatPLN is about connecting with people. The technology is just the means by which you make andmaintain the connections. Following are some examples of visuals that people created to represent theirPLNs. However, please note again that some of these are tool focused. This challenge is to create one thatis focused on people, groups, and communities that are part of yourPLN (Be specific. Instead of “blogs”, you might represent specific blogs. Instead of Twitter, you might include influential people on Twitter. Instead ofwebinars, you might list specificwebinar hosts or communities that are valuable to you). a long list of visuals representing PLNs or PLEs (E is for environment). Are you up for the challenge? If so, consider announcing your participation via a comment to this article/post. Also, consider sharing it with others on your favorite social media outlet. At a recent conference (and some follow up chats), I invited people to suggest articles that they would like to see on Etale.org in the upcoming year. One person suggested an article on managing digital distractions. So, here is it. Several years ago, I was presenting to a group of University faculty about the changing nature of teaching and learning in an increasingly digital world. At one point, I invited faculty to break into small groups and develop a list of ways that they hope to respond to these changes. One group of faculty, largely faculty that teach classes in the general education program, honed in on a problem that they saw in their classes, namely more students bringing laptops and cell phones to class. The group collectively agreed upon a solution. Ban laptops and cell phone from their classes. I’ve not stayed in touch with many in that group over the past few years, but one of them recently informed me that he maintains this policy. Students in his class are prohibited from using laptops. They must take notes in traditional notebooks or nothing at all. This is certainly one approach to managing digital distractions, but it is not a viable option in the classroom that seeks to leverage laptops and mobile technologies for teaching and learning. As more K-12 schools and a growing number of University departments are implementing 1:1 programs, the chance for digital distractions is greater than ever. Of course, this is larger than school or the classroom. Digital distractions impact many of us in school, work, home, while driving, while waiting in lines the store. Looking at the topic as an educator, my concern is not simply about managing distractions in the classroom, but about helping learners grow in their ability to balance the digital and non-digital aspects of their lives. As noted by Nicholas Carr in The Shallows: What the Internet is Doing to Our Brains, many of these daily experiences (browsing the web, checking email and texts, checking in our family social media outlets) provide an immediate gratification to the brain. Similarly, in the introduction to Neil Postman’s Amusing Ourselves to Death, he muses about whether our future is one that resembles 1984 or A Brave New World. In the former, we give up our freedoms to protect us from our fears. In the latter, we are consumed by our pleasures and immediate gratification. Impulse control, postponing gratification, and reflection remain important aspects of life in an increasingly digital world. Without these, we find it difficult to make decisions that align with our values and convictions. Instead, we just follow our desires of the moment. So how to we manage this? I do not see how banning devices will serve as a helpful solution in most circumstances. I certainly appreciate the occasional media fast, but what seems especially helpful is to provide learners with a chance to read, reflect, and discuss these matters. Provide them with the opportunity to document their current digital consumption practices, to reflect upon their core values and convictions, to learn about important ideas and perspectives on life in the digital age, and invite them to develop a plan of action in various spheres of their lives. Some sort of journaling or goal setting can be helpful. In other words, I am suggesting that this is something that we invite student to decide (with proper mentoring and guidance) and not an authority making all the decisions in advance, preventing learners from being active participants in the plan. This approach gives students the opportunity to exercise their ability to self-regulate and to grow as more self-directed, thoughtful, and intentional people. Boundaries are still important, but within those boundaries, it is equally important to give learners a chance to think, plan and act in a way that aligns with their beliefs and values. This is what will equip and empower them to do so once they are beyond the more frequent direction of authority figures like parents and teachers. This can be done in any number of ways. One option is to give learners a chance to develop drafts of a plan to manage their digital technologies (anything from mobile devices to computers an game consoles), explaining the reasons for the different decisions in different contexts (classroom, in the car, at home on weekends, while hanging out with friends, etc.). What type of person do you want to be? Workshopping these plans with peers and getting feedback from parents, teachers, and other mentors can also be a valuable part of the process. After getting some external feedback, the learner can develop a second draft and use this as a guide for a set period of time, occasionally revisiting and refining the plan as needed. As I’ve noted in any number of posts, technology is not just something that we use. It uses us as well, and awareness about the affordances and limitations of technology combined with an awareness of how different technologies can help or hinder us from living out our own core values and beliefs can be quite powerful. This approach is in contrast to pre-developed lists of do’s and dont’s. While moderate use of such lists can offer important boundaries. Overuse of such lists risks preventing students from taking responsibility, being unnecessarily restrictive, and losing a sense of shared ownership in the task. In the end, I’m simply suggesting that we help learners take the opportunity to think deeply about the role of digital tools in their lives and to help them take responsibility for making intentional plans and enacting those plans. As I continue to speak and write about both project-based and self-directed learning, I come across people who have any number of pre-existing beliefs about these approaches. Toward that end, here are five myths that I often encounter. Within each myth are valid, important, and significant questions and concerns, but it is important to dispel the myth that they accurately represent what happens in project-based or self-directed schools. The reality is that traditional schooling still dominates in most schools, so those exploring alternatives can benefit from learning about the common myths and considering how they can respond to them. Of course, the most convincing response is simply inviting them to spend a day in a well-designed project-based or self-directed school. Myth #1 – “These types of environments are just for the advanced students.” – I hear this often as people argue that certain students need more direction and structure. In reality, this has nothing to do with academic giftedness. I’ve seen many types of learners thrive in project-based and self-directed environments. What seems to be more important is whether students are willing to embrace a school culture that focuses upon learning and not earning grades, credentials and traditional accolades. Are they willing to learn about asking great questions, developing strong research and communication skills, and growing in their skill with self-monitoring, self-direction and time-management? If so, then they can thrive in a project-based or self-directed learning environment. It is true that some students may enter such a school more or less prepared. That is where some scaffolding may be necessary to help students cultivate some of these skills and perspectives. Myth #2 – “Project-based Learning and Self-directed learning schools are all basically the same thing.” – There are hundreds of ways that people come together to envision and start a project-based or self-directed learning environment. There are multiple approaches to and working definitions for both project-based learning and self-directed learning. Some project-based schools emphasize team-based shared projects while others are largely individual projects. Some self-directed schools have lengthy processes for planning and proposing projects, while others are almost entirely student-directed (including the process). Some have teachers and learning coaches who still play a large role in directing students each step of the way, while others leave more of that to individuals or groups of learners. Myth #3 – “Traditional schools are better at helping students develop breadth of knowledge where these schools may be better at depth of knowledge.” – There is truth to this. Students are exposed to a systematically broad body of knowledge in different content areas in a traditional school. And yet, if we interview learners from different types of schools in their mid-twenties, we are unlikely to find a significant difference in the breadth of knowledge among the learners. Part of this has to do with the minimal knowledge retained by many in the traditional schools, so the real myth is that exposure or “covering material” results in retaining it. Myth #4 – “If students don’t experience traditional schooling now, they will be at a disadvantage at the next level.” I’ve yet to find any strong evidence to support this claim. Instead, project-based and self-directed environments give learners a chance to develop the skills that we know make a difference in life after school, things like critical thinking, time-management, follow through on projects, research skills, the ability to learn something in teams and with little direction, initiative, and self-discipline. You will find graduates of these schools in top Universities around the world. Myth #5 – “These alternatives are not as rigorous as traditional schooling.” It is true that they have fewer or no tests, that they don’t force students to all do things in a similar way, and that there is more student choice in the experience. However, these approaches, when done well, promote a level of depth that we rarely find in traditional classroom environments. Over a four-year high school experience, many students are developing a collection of eight to sixteen projects that more closely resemble a college research paper or senior project than the typical work in a traditional high school. In addition, these students often have the challenge of presenting and defending their work to an audience of peers and/or community members. That can be quite rigorous. In fact, one can earn an entire master’s degree or doctorate by research (without attending any classes) at some of the oldest and most distinguished Universities in the world…basically using a model similar to what we see in many project-based or self-directed learning environments. My Concern about Digital Bloom’s Taxonomies? I’ve noticed a growing number of visuals of what some are calling a “Digital Bloom’s Taxonomy.” The idea behind these visuals is to include the typical triangle used for Bloom’s Taxonomy, with “remembering” on the bottom and “creating” on the top. Here is the original post of one of the earlier versions that I’ve seen on the web (from 2009). Note that Bloom’s Taxonomy is called such not because Benjamin Bloom created it on his own, but because it was developed by a committee that he chaired and published in 1956 in a worked that he edited called, Taxonomy of educational objectives: The classification of educational goals (a worthwhile read, by the way). The title of this text also indicates the intention behind the taxonomy, to create a system for classifying different educational goals, starting with basic goals and leading up to more complex educational goals. To the best of my knowledge, a key intent behind this project was to create a communication tool for test design that measured varying levels of student performance. With this background in mind, I return to the idea of a Digital Bloom’s Taxonomy. A taxonomy is intended to categorize and help us make sense of information and knowledge. A taxonomy is a classification system, and the value of a taxonomy is measured in part by the accuracy and usefulness of the classifications. What do these digital taxonomies clarify for us? Do they accurately represent the use of technologies at different levels of Bloom’s Taxonomy? When we see these various “digital” versions of Bloom’s Taxonomy on the web, they are usually in a visual format, aligning certain educational apps or online resources with different levels of Bloom’s Taxonomy. For example, this version places tools like Del.icio.us (a social bookmarking tool) and Flickr (an image-sharing site) as being at the lowest level of Bloom’s Taxonomy (remembering). Other tools, like Wikispaces and Prezi are listed at the top of the triangle (creating). What does that really mean? Does it mean that a person using Del.icio.us is only performing at the remembering level of Bloom’s Taxonomy? Does it mean that a person carefully crafting a photograph, sharing it, and providing a short written explanation of the photo on Flickr is not engaging in analysis, evaluation, or creation? Consider a class where students are working on a student-centered project and they are conducting research for this project. The student might collect relevant sources and include a meaningful analysis/annotation along with the link on Del.icio.us. That is analysis, not remembering. Or, what about the student using Wikispaces to by Googling a term for the project and flippantly cutting and pasting topical links to a Wikispaces page? Is that the type of high-level creative thinking that we mean when we are talking about Bloom’s Taxonomy? My concern is that these digital taxonomies oversimply our thinking about the design of learning experiences that promote higher-level thinking. It is not the tool or app that you use, but how you use it. Yes, some tools have affordances that might lead toward (but not force) certain levels of thinking, but almost all the tools in these digital taxonomies lend themselves toward any number of uses and many levels of thinking. Consider another visual attempt to align apps to Bloom’s Taxonomy here. Twitter is placed at the “understanding” level, when we could easily design learning experiences in Twitter that involve remembering, understanding, applying, analyzing, evaluating, or creating. I’ve even seen an entire Passion Play designed and facilitated on Twitter. As I look at it, teaching and learning at different levels of Bloom’s Taxonomy is not easily broken down into the use of one app over another. This is a matter of learning experience design and the ways in which learners are using a given tool or app as a lever for learning. I’ll admit that I find these digital Bloom’s Taxonomies fun and interesting, but I don’t find them to be especially useful as a teaching and learning tool. In fact, I am concerned that they misrepresent the role of individual technologies in teaching, learning, and thinking. What useful information do these digital taxonomies actually offer us? Perhaps you see them from a different and more helpful perspective. Either way, I would be interested in your thoughts.